Kate Kelly and her son Albert Evans live together in a home under the mountain, in Hobart, Tasmania. Kate is a writer and visual artists and Albert loves to draw, ride his bike and eat marshmallows. 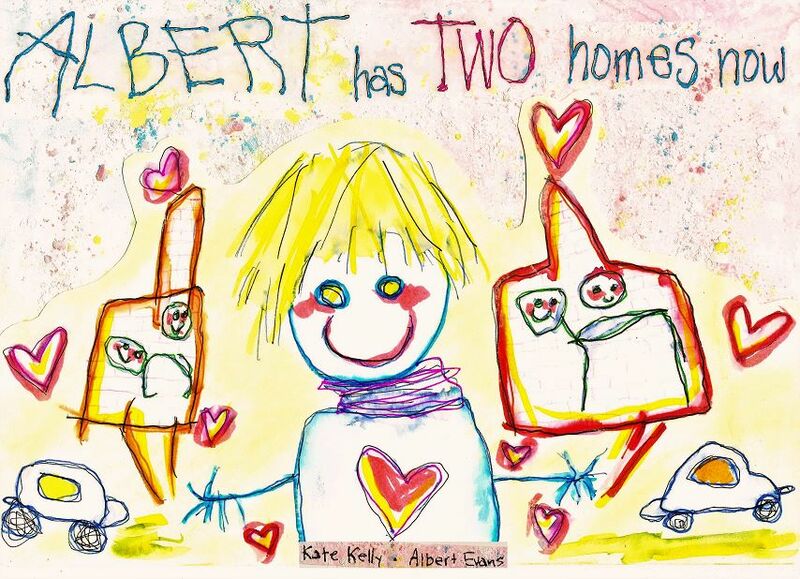 Together they explored the emotions and understandings from Alberts perspective of his parents separation, and created a unique and uplifting children’s picture book which is one of our June Recommended Reads. We recently caught up with Kate Kelly to find out more about their new book, and the unique process she used with her son to make it. Could you talk me through the process of how you and your son wrote and illustrated a book together? When my partner and I separated in 2016, our son, Albert, was 3 years old. To help him (and us) navigate a way through what was going on, I sought out books about family separation for young children. Although I found numerous books for children on divorce and separation, they were consistently written from an adult point of view, often targeted at children over 5 years old and focussing on explaining separation, which in itself is an adult concept that very young children cannot grasp. These books consistently relied on a child being emotionally mature enough to be able to ‘ talk about their feelings’, which is hard for any children, but especially for children so young who are still learning to handle emotions. Albert found many of these books baffling, sad, and scary and was left with lots of big questions -with answers he was too young to understand. He had started to withdraw, become insecure about me leaving him and worried about where daddy was. He had a lot of anger and confusion. After him saying he was scared of monsters and the dark and him becoming increasingly anxious and clingy, I realised something had to give. As an artist and writer, creativity has always helped me find solace and sense in times where words fail me, and has been a healing catharsis in times of emotional upheaval. I thought that making art could also help my son, who was still too young to talk about his feeling in words alone but was very creatively uninhibited when it came to role playing, drawing and making things so I turned to art as a way of us opening up to each other, and it worked amazingly. Through the process of many days of talking and drawing together, the book was born. At what point did you realise you had something that could be published? Funnily it was Albert who first said we should take our book- (the only rough draft) ‘to the shopkeeper book man’. We had it kicking around for a few months or so, reading it together at bedtime. I showed it to some friends and people kept encouraging me to send it to a publisher. My friends said they wished they had a book like this when they had been through their divorces. Given that the reason we wrote it was because there was nothing like it on the market, I started to consider publishing. I did my research and discovered that I couldn’t find any books like this that were co-authored by, and featuring the illustrations of the child- in effect- books directly voiced from the child’s own personal experience. Turns out Bert is the youngest published illustrator/author in the world, but the title of youngest author still goes to a 6 year old boy who has apparently written his own novel, and we certainly would not want to steal any thunder from that kid! Your book will be something many families can relate to, however it is still a very personal story. How did it feel putting this work out into the public? Were you nervous about it, or did it feel liberating? 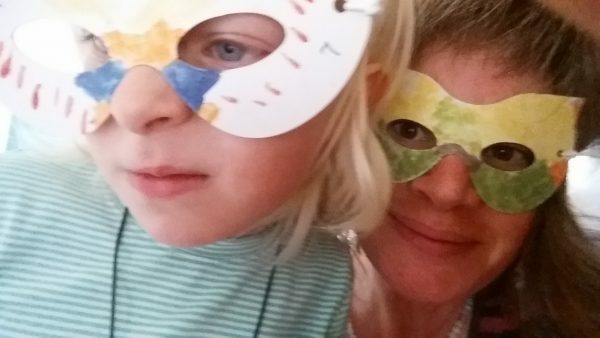 It was exposing, I questioned if it was ‘too personal’, but I was driven by how effectively art therapy activities had allowed me to meet the needs of my young child ,and enabled me to help and comfort him at a time when we as parents, feel so powerless. I wanted to help other people, who like me, had gone looking for something like this, or who wanted to help little kids, for whom verbal expression is secondary to creative expression- in how they process and make sense of their world. In regards to making it public, I was more concerned with how Albert would feel about the process, and wanted to protect him from unnecessary attention, as he can be quite shy. I think focussing on his being ok with it distracted me from thinking about my own feelings and fears, which is probably a blessing. I discussed it with my ex partner who was very supportive and we had wonderful support from my publisher- 40South, who were so intuitive and really guided the vision for the book to where we wanted it to be. It feels like liberation now, it was certainly cathartic, and for our little separated family- sitting together as Albert and I did the book signings on launch night, we felt good about how far we’ve all come. How has Albert felt about the publication? Was he proud, nervous or a little unaware of what he’s achieved? He was all three things. It has been over a year since we wrote it, so the process has developed alongside his own maturing, and he has taken it on board in his own way and time. I have tried to communicate with him about it all along and move with his comfort level. People recently started congratulating him on being an author and I wasn’t sure if he really understood what they meant, but the night prior to the launch he was too excited to sleep and when I said he needed to sleep or he’d be too tired for the book launch, he exclaimed, ‘But Mummy, I have to be at the launch because I am THE ORFA, you should go to sleep so you can drive me there.’ He is pretty sharp and like all kids, probably gets a lot more of what is going on than we adults realise. Has making the book changed the way you and your son communicate with each other? It’s an interesting dynamic creating a book with your son. Who was leading the story, did it take much editing on your part? He is a brutal editor, and yes, it did! Every time I finished a text draft I would read it and he would correct me with things like-‘ No mummy, that is a dream with THREE dogs AND a friendly ghost’, but I know the success of this project rests on it being true to his experience, so it was vital that he was happy with the final draft. In making the book, we sat down together and he talked and drew and I queried and transcribed everything he said. He had a story for each picture and we talked while he made them. I tried to keep the narrative as authentically close to his original words, but 3 year olds tend to digress, do not understand the concept of a narrative arc, and live in the moment, so it took a lot of patience and literary license on my part to hone his many pages of excited rambling into a story that was workable, yet authentically his own. Thankfully, he had some very clear points around each image, which gave me anchoring concepts to work out from. When he was drawing the picture of his dad in the removals truck, he said, unhappily ‘I was sad when daddy left …’ but in the next breath, excitedly said- ‘but then he came back with a big truck and we put my toys in it and daddy took me to see the new home!’ Most of the book text still contains his own quotes about the drawings. Every picture in essence is a small and complete story, and what was a wonderful realisation for me, was his up-beat endings to each one. What sort of response have you received since the book was launched? Has some of it taken you by surprise? The response has been enthusiastic from all the places I hoped it would be, the early learning and families sector, schools, health services, basically anyone working with young kids and single parents. I have had the great fortune to become acquainted with some inspiring people in the areas of arts practice and children, people such as Victoria Ryle and Simon Spain, who co founded Kids Own Publishing and All That We are, who have long been vocal advocates for the myriad benefit to communities of letting children tell their stories in their own words. I think the unlikely joy that will come out of this book for me, is collaborations and connections with likeminded writers and artists. The Governor, the hon Kate Warner AC, launched the book for us, and her genuine positivity and kind words about the book were very meaningful for me. I have been told that one local bookshop has already sold out twice, and that many of those sales were to single mums who had heard about the book. This is the most exciting feedback for me so far. The fact that people are already seeking it out in an effort to help families has reinforced for me why we did it and is so encouraging. We have had some great media coverage, but as with all books, when the dust settles a bit you have to get it out there in earnest, and I am aiming to get involved with some local schools and kids events for book week and start contacting potential mainland and international customers who work with kids and families. I am not surprised at the response, but I am overjoyed that my gut instinct about publishing this story was right. What next? Is this a once off response to a big chapter in your life or has it inspired a process that you want to pursue further? Writing has long been my secret passion, I feel like this has fulfilled a part of that dream for me. Albert and I are intending to do another couple of books, one about his Nanny having wheels for example, but as the process is guided by his experiences, I have to work around him. We have started one book about looking after a pet, which has almost reached first draft stage, so maybe that will come next. I am writing and illustrating a book currently that is aimed at slightly older children, is a short fictional novel style picture book about overcoming fear and imaginary limitations. I try to enter writing competitions as they come up. I am also training to become a Wedding and Funeral celebrant, specialising in LGBTQI and non denominational life ceremonies. I have a bit going on I guess…but yes, even if it’s just on napkins or in my journal, writing and art are a part of life as I know it. What can we, as the audience, take from your book as far as the process goes? Is there something you’ve learnt that we can all feel encouraged to do with our own children or people close to us? What I have learned is not to assume I can fix everything – it’s scary and liberating. Sometimes in life my kid will be in pain, and I can’t take that pain away, and maybe- it’s not right to diminish his experience by wanting to. My job is not to fix it, but to give him enough love and tools so he learns how to move forward in life with positive coping strategies and fearlessness. He knows he can be hurting emotionally but still be safe and ok, and that I am listening and present with him through it. This has given him and I so much confidence in ourselves and each-other. Finding a way to listen to children in their full range of expression, is very beneficial for everyone, but as adults we really need to get on their level, and sometimes that means stepping into unknown territory. I realised how wise and resilient children can be, and how we often underestimate them. My son surprised me with his perspective. I didn’t need to explain why daddy was gone, or for him to understand why we had two homes, but just that nothing he loved or wanted or needed would change. Adults live with one foot in the past and one in the future, he was living it moment to moment, and just needed to know that it’s ok to feel all your feelings, that the important things like love stay the same, and that just because things are different, doesn’t mean he has to be afraid. The best thing I realised is to be more present.